Astrophysicists have discovered a remote galaxy shining with the light of more than 300 trillion suns. 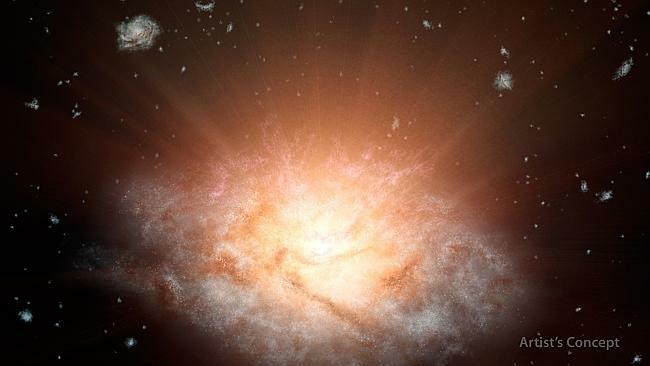 Known as WISE J224607.57-052635.0, it is the most luminous galaxy to ever be discovered. It was located using data from NASA’s Wide-field Infrared Survey Explorer.NASA believes the discovery will change what we know about the universe. “We are looking at a very intense phase of galaxy evolution,” NASA said in a statement. The team believes massive black holes at the centre of the galaxy are responsible for the strange phenomenon. “Supermassive black holes draw gas and matter into a disk around them, heating the disk to roaring temperatures of millions of degrees and blasting out high-energy, visible, ultraviolet and X-ray light,” NASA said. “The light is blocked by surrounding cocoons of dust. As the dust heats up, it radiates infra-red light.” While black holes at the cores of galaxies are nothing new, NASA said finding one so deep in the cosmos was rare.